REDtone SIPhony is an enterprise-grade internet-based phone system that designed specifically for SMEs, SMIs, small businesses and start-ups seeking to take control of their voice costs. No physical phone lines required. REDtone SIPhony offers full suite of features in apps form. Prepaid model, with no contract tie to it. Best of all, you only subscribe to features that meet your current business requirements. Available in mobile app form, the “Extension” feature provides comprehensive VoIP features such as making and receiving calls, transferring calls, voicemail notification, and call conferencing for up to 8 parties. BizPhone allows businesses to assign extension numbers (which are connected to the main business number) to designated workstations/employees. A call forwarding app that lets you forward calls to 6 mobile, DID or overseas numbers. A reliable SIP trunking solution that allows you to receive and make calls from any device, i.e. IP phone, laptop or softphone. Enjoy carrier-grade call quality at much lower rates. Customise your own automated voice answering machine. 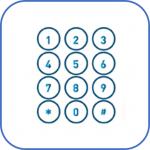 Offers a multi-layered IVR menu with ring queue and ring group numbers. Enhances call management efficiency and reduces manpower cost. Enables you to record and store all incoming and outgoing calls. You can playback or download the file anytime. An essential feature for training and compliance purposes. We provide nationwide numbers so you can assign a direct number to your employees without requiring multiple physical phone lines. Fax app allows you to send and receive faxes on any devices connected to the Internet, without bulky fax machine and papers required. A reliable SIP trunking solution for better call quality at much lower call charges. SIP Trunk can be instantly purchased, upgrade or downgraded as your need arises. You can also have local presence in 60+ countries with our wide range of landline, mobile, toll-free and golden DID numbers. Designed for demanding customers with reliable high bandwidth needs, REDtone Metro E allows you to enjoy high-speed, high-volume data transfers. Take advantage of the transformative benefits of cloud, with the potential to add more complexity as your business infrastructure expands. REDtone flexiCloud acts as a catalyst for innovation and digital transformation. Prevent DDoS attack to your network and safeguard your business. Highly recommended for organisations that cannot afford any downtime of assets running their own network.